Although he has never addressed the subject directly I suspect my self labeled “Genuine white Supremacist” neighbor is a sample size of one. He calls himself a white Supremacist but denies any connection with or allegiance to any of the typical white supremacist movements including Nazism, the Ku Klux Klan or Christian Identity. I have asked him if he belongs to a group or church and where he learned his philosophy from but he never seems to want to answer that question. At this point if I had to guess as to where his philosophy came from I would say he simply made it all up on his own. In this respect I cannot say with any certainty that his white Supremacy is indicative of white Supremacy at large. He claims to be a Christian. Normally I would not question the veracity of a person’s claim to be Christian. However, he also claims that true Christianity requires a person be a racist and anyone who is not a racist cannot authentically call themselves a Christian. Certainly, I support the right of anyone to make outrageous claims on their own blogs or platforms. But he insists (for some reason) on posting his radical philosophy in the comment section of my blog posts. As such I believe it is entirely in my right to respond to him in this way. He claims his racism is a “traditional” racism which is not to be confused with the “liberal” definition of racism. According to him, “traditional racism” actually means “love of Father” and not (as he says the liberal conception of racism espouses) hatred of the black man. This love of Father in his mind is connected with the “white race” and his line of white fathers which he claims stretches back in an unbroken white line all the way to God the Father Himself. He specifically rejects the scientific consensus that all presently alive humans (black and white alike) can trace their ancestry back to a common line of fathers. Presumably he sees this research as a liberal conspiracy or some such. Despite his claims that his racism is a love of father and not hatred of “other” he has specifically stated he is against racial mixing and integration. In this respect, I am not sure how his love of father differs from hatred of the other. It seems as if he does not want to fully own his racism. His logic in claiming Christianity endorses racism seems to be rooted in the primacy of racism in his own mind. In other words, he believes racism is true and correct and that Christianity is also true and correct. As such Christianity ipso facto must endorse racism and anyone who does not endorse racism is ipso facto not a real Christian. The rather glaring problem with this logic is not only that there is no scriptural basis to support this argument, there is substantial scriptural basis to reject this argument. In the Gospel of Luke, Jesus teaches that love of God and love of neighbor are of primary importance under the law. By saying that love of neighbor is second only to loving God with all one’s heart Jesus is ranking love of neighbor above the commandment to honor one’s biological parents. When asked “who is my neighbor?” Jesus responded with the parable of the Good Samaritan. … A certain man went down from Jerusalem to Jericho, and fell among thieves, which stripped him of his raiment, and wounded him, and departed, leaving him half dead. And by chance there came down a certain priest that way: and when he saw him, he passed by on the other side. And likewise a Levite, when he was at the place, came and looked on him, and passed by on the other side. But a certain Samaritan, as he journeyed, came where he was: and when he saw him, he had compassion on him, And went to him, and bound up his wounds, pouring in oil and wine, and set him on his own beast, and brought him to an inn, and took care of him… Which now of these three, thinkest thou, was neighbour unto him that fell among the thieves? And he said, He that shewed mercy on him. Then said Jesus unto him, Go, and do thou likewise. (Lk 10:30-37). Here we see Jesus explain that one’s neighbor is defined by his behavior (specifically acts of kindness and compassion) and not by race or political affiliation. This point is made even clearer when one considers the fact that Jews and Samaritans were of separate lineages and enemies in the context of this story. Certainly, if Christianity preached a gospel that racism is of primary importance that fact would have been referenced in this parable. Indeed, in the Gospel of Luke Jesus specifically states that one must reject his biological ties in order to follow him. It is the consensus of biblical scholars that this rather strongly worded passage is properly interpreted to mean that a follower of Jesus needs to prioritize Him above one’s kin. At the very least this passage calls into question the notion that love of one’s line of fathers is of primary importance for a true Christian. In the Gospel of Matthew, the risen Jesus instructs his disciples to “… teach all nations…” (Mt 28:19). There is no instruction to restrict Christianity to white people or to any specific people as there would have to be if Christianity espoused a doctrine of racism. In Paul’s letter to the Colossians he says to “[s]et your affection on things above, not on things on the earth.” (Col 3:2). Clearly one’s race is tied to materiality and of lesser importance that one’s life with Christ. In light of these and many other passages I could reference there is simply no scriptural basis to support the idea that Christ taught a gospel of racism. 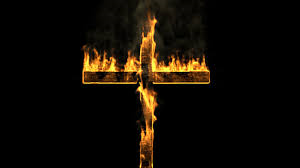 When I consider this in light of the fact that I have never heard anyone argue that Christ taught racism and the fact that my self labeled “Genuine white Supremacist” neighbor does not claim to belong to any particular community of fellow believers, I must conclude that he is very much alone in the world. Although his beliefs are interesting in their bizarre complexity and consistency I do not think they reflect anything greater than the contents of his own mind.